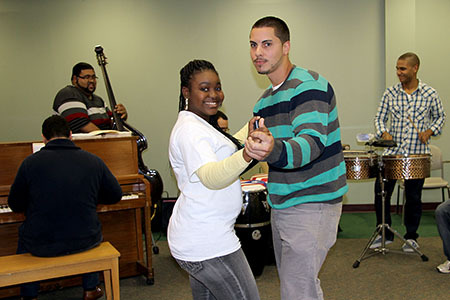 Trenton, N.J. -- There was music, dance and delicious food at the Trenton Campus as the college closed out its celebration of Hispanic Heritage Month, observed annually from Sept. 15-Oct. 15. 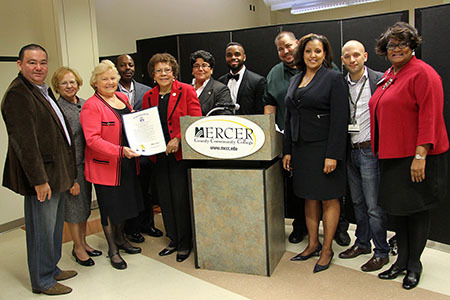 Putting an official seal on the closing ceremonies on Oct. 15 was State Senator Shirley Turner, who visited the campus to present a Joint Legislative Resolution to honor and observe Hispanic Heritage Month. In presenting the resolution, which was sponsored by Senator Turner, Assemblyman Reed Gusciora and Assemblywoman Bonnie Watson-Coleman, Sen. Turner pointed out that one month is not enough to recognize the significant contributions to American culture by the Latino community. "There are so many enormous contributions that the Hispanic people in this country, as well as in New Jersey, have made," she said. As stated in the resolution, "The strength and success of the State of New Jersey, the vitality of our communities, and the effectiveness of our American society depend, in great measure, upon the distinctive and sterling qualities demonstrated by our various ethnic groups, exemplified by members of the Hispanic community, who share with us their rich heritage..."
In her remarks, MCCC Executive Dean of Student Services Dr. Diane Campbell noted that the college is pleased to honor and celebrate the cultures of MCCC students of Latino heritage. “MCCC counts a growing number of Hispanic students in its student body, not only those who are native born, but also international students who choose to attend college here,” she said. Dr. Campbell noted that many students seek out educational opportunities at Mercer because of its strong English as a Second Language programs. “They may be well educated in their countries of origin, but they need to be better English speakers to succeed in the United States and they turn to us,” she said. 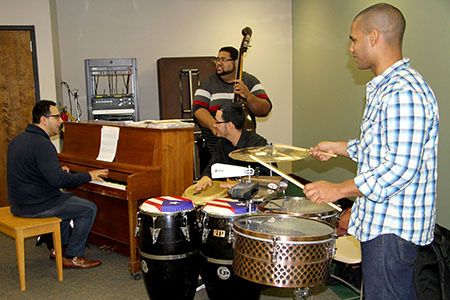 Music for the three-hour celebration was provided by Calle Sol, a four-piece Latin and Latin jazz ensemble that featured alumnus Dennis Guevara on piano and current MCCC student Ernesto Medina on congas, as well as Victor Pablo on drums and Wilson Andujar Jr. on bass. Heritage Month at the Trenton Campus Oct. 15. Dr. Diane Campbell, MCCC President Dr. Patricia C.
Dan D'Arpa and Monica Weaver. as part of the closing festivities. Students dance to the Latin beat.